Add natural texture to your art and craft projects with the Angel Wing Heavyweight Mulberry Paper. This paper features a textured white base with scattered bright yellow "Angel Wings" or seeds from the Shyonaka plant, providing added texture and design. See a more detailed description and specifications below. Incorporate the beauty of summer to your crafts with the Angel Wing Heavyweight Mulberry Paper! 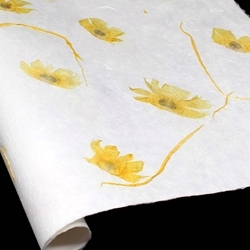 Handmade in Thailand, this Kozo paper features thin, papery, flying seeds from a plant known as the "Shyonaka". This heavyweight paper weighs 200 gsm with a thick, textured surface consisting of mulberry and Kozo pulp. The Angel Wing Mulberry Paper is perfect for note cards, book binding, weddings, invitations, and more!